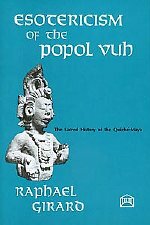 The Popol Vuh, an ancient American spiritual epic, is the Quiche rendition of Mayan cosmic philosophy. In allegorical form it describes the origin of the universe and of the gods, as well as their offspring — mankind — and the complex evolutionary cycles they experience. Professor Girard spent many years among the Mayas in Central America learning much from direct association with their Elders, and offers a unique approach to the mysteries of native American thought.